Haveil Havalim Blog Carnival #180 is now up at My Shrapnel. I almost never comment on U. S. politics unless it is to call the participants evil, like Gog Bush and CON-deleezza Rice, or to denigrate those involved in other ways. But as I pass the time watching news video clips on FoxNews.com, I cannot help but see certain things which just,...well,...stick out. One is that Sen. Barack Obama (D-IL) still isn't really saying anything. I saw most all of his acceptance speech. He has yet to say anything specific about what he intends to do to "change" anything, except for applying the trial and error approach. Tell me, Sen. Obama, is Iran a "tiny country that doesn't pose a serious threat," or is it a "serious threat" which needs to be "eliminated?" The other is regarding Sen. McCain's choice of Gov. Sarah Palin (R-AK) as his running mate. Well, I saw all of her speech, and I believe I can answer that question everyone's asking, "Why Sarah Palin?" Remember Sen. Obama's "clinging to guns and religion" crack? Well, John McCain just picked one of Sen. Obama's targets to be his running mate. Experience or not, Gov. Palin brings something to the campaign which has the potential to rally the disenfranchised to his side. I believe people will be able to relate to her, and that her limited experience in government may be an advantage. She has executive experience, yet appears to be unscathed by the corruption she has been fighting against. Also, I'd take Palin's foreign policy experience, or lack thereof, over Obama's, any day (See above). In a nutshell, she seems real, and will certainly give Sen. Biden's (D-DE) attempt at a "regular guy" image a run for its money. Whether her being a woman, a strong pro-lifer, an evangelical christian, or one of those "regular folk" from Ohio, Kentucky, Pennsylvania,...and Alaska, was first on McCain's list of reasons for choosing her is irrelevant. He has definitely killed four birds with one stone. Whether or not this strategy survives the test of time, that remains to be seen. Perhaps only as early as November 5, the day after the election, will this question be answered. One of the reasons I don't write about U. S. politics is because I really don't care, albeit I am somewhat entertained by it. No human power will be the source of salvation nor destruction of Israel or the Jewish People. It is incumbent upon us not to waste any of our time putting our faith in any of these people or external forces. On the other hand, if my absentee ballot arrives on time, I'll be willing to spend the NIS 4.60 on a stamp to send it in. We'll call it my hishtadluth (personal effort). Yehuda at Gaming and Blogging in the Holy Land hosts this week's edition of the Haveil Havalim Jewish and Israeli Blog Carnival. Unfortunately, he had to deal with glitches in the Blog Carnival submission system, which I imagine made hosting a bit of a pain in the neck. Please check it out. Yehuda includes over 50 posts about the First International JBloggers' Conference which took place last Wednesday in Jerusalem. In particular, I recommend that you check out his contribution to the fray. Ezra's Heise Fefferlach Salat Mit Garliclach! Thanks to my buddies Ezra and Yekutiel, I [almost] always have a place at a dinner table for Shabbath. I rarely leave Tapu'ah for Shabbath, not that I don't want to, hint, hint. So when I'm stuck in the yishuv, it's nice to know I have a place to go where [almost] everyone knows my name. I really DO enjoy going there. I just say "stuck" for,...well,...other reasons. Spicy food is the rule at Ezra's table. That includes the salads and the soup. But the ultimate harif (spiciness) comes in the form of whole peppers and a particular pepper salad that are usually brought to the table by one of the regulars, bought in the Ge'ulah neighborhood of Jerusalem. Ezra claims that on the previous Erev Shabbos, someone mimicked this salad, and showed him the secret recipe. This was a crucial event, as we can now rest easy knowing that this special Shabbath salad will always be present with us at the table. Ezra calls is the Heise Fefferlach Salat Mit Garliclach. Where the name comes from is a story in and of itself. The short version is the "Fun With Yiddish" some of us would could have at the table, butchering the language, like over-doing the diminutive suffix of "lach." Ezra's idea. Funny, huh? Well, the hassidim (and Litvaks) who periodically grace the table seem to think so. But, of course, they're mostly laughing at how bad my Yiddish is, period. It's usually the non-Haredi crowd which would could thinks it's offensive, which in typical junior high school fashion, just makes me would could to butcher it some more. But true test of Heiliker Menschlechkeit for all of the guests comes when offered the Heise Fefferlach Salat Mit Garliclach. I make a big point of showing the gantze yeshiva bochurim how it would could be done. Then there's the same old maiseh mit de zup. Yekutiel asks if it's too spicy. The guests say yes, and Ezra and I say it would could be nisht enough spicy. 1. Take a hot Red Pepper and chop it up. 2. Take a hot Green Pepper and chop it up. 3. Take some gaaaahrellic and chop it up. 4. Put it all in a small decorative bowl, or if you're a single man, a small, environmentally-incorrect, disposable bowl. 5. Add some olive oil, homemade if possible. Who ever said that "right-wing" extremists would couldn't have a sense of humor? 1. If you think that I'm making a shameless plug for the olive oil (pictured above) from the Mesheq Ahiyah olive press near Batya and Yisrael's, then you would be correct in your assessment. There's also a good olive press in Itamar, which environmentally-correctly makes full use of the left-over olive meat and pits. Just bring your own olives, and they'll do the pressing and filtering, and in regular years, separate terumah and ma'aser for you. 2. Someone suggested that I might want to submit this to next month's edition of the Kosher Cooking Carnival. I just hope it doesn't upset, insult, or offend all those JBloggers and readers with the custom of refraining from harif (spicy) and hamutz (sour or pickled) on Rosh HaShunneh, and some all the way through Simhas Tairah. 3. I almost forgot. I suggest that the white ribs of the pepper be cut out and not used for this salad. Funny how the following piece of information about that hideous JBloggers' Conference was conveniently left out of Bloggers' various "The Day After" Assessments? If I missed them, please list those links below in the comments section. The Foreign Ministry and the Re-Branding of Israel; Again? It is too bad that the branding director’s portrayal of the foreign ministry’s branding solutions are nebulous. She referred to multi-cultural — a nation with 3 religions and one could not help but view her “solution” in the context of leftist foreign ministry agendization; a “state of all its people.” We tend to let such characterizations pass without protest and to tolerate too much. When the speaker referred to Branding research and analysis contracts with Livni heavily involved, and then mentions about 3 religions in Israel — the combination is too much to take. I'm glad to hear that one blogger had the guts to question the government and its policy. Please tell me that he was not the only one. This is unacceptable, Jewish bloggers just sitting there and listening to this tripe. As I predicted, this the same old public relations, "Goyim, please like and validate us," codependent crap the Jewish people have been trying, and failing at, for generations. Time for a new strategy. It is high time we care about what HaShem thinks and not what the goyim think. Rabbi Meir Kahane HY"D tried to deliver this message from the Torah, but it fell on deaf ears. But, of course, this change in strategy will never happen with an Yishma'el and Esau-loving, Eruv Rav government and governmental system. C'mon were the social aspects of the conference really all that worth the compromising of your principals? Yeah, I'd say that the tolerance of the same old Israeli government idiocy proves at least one of my original objections to the conference. The "biggies" in the first panel were asked, by me, to at least mention when carnivals are posted and link to them to give more exposure. One panelist was very snobby about it and said that he didn't consider us a "community;" it was just his hobby. That was the low point of the entire day, since the entire point of the event was networking, community etc. The other panelists had davka used the term "community," which is why I did. He was very haughty and said some nasty stuff to another questioner who wanted advice on how to promote a blog. He said that he'd never seen it, but he knows that attractive blogs get more readers. Gee. I wonder who THAT could've been. Never mind. Doesn't matter. Another one of my objections has been proven. About six months ago Aryeh Zelasko's plan below appeared on Arutz 7. He had told some of us about his plan before that. I was intrigued, and have working toward this goal for a while now. After receiving a notice from my bank last week about "account inactivity," even though I actually have money in the bank, I thought it was time to do more to help publicize Aryeh's plan. It is republished below, with his expressed permission. His plan can also be found in Hebrew, if you prefer, by clicking here (עברית). I don't know about you, but I don't like having my bank tell me what to do with my money, Qal weHomer (even more so, the government). The time has come to use a serious weapon. We have tried demonstrations. We have tried elections. internationalized, and the Arabs are to be given yet another large chunk of Israel to control and use to destroy what little is left over of the State of Israel. We have tried demonstrations. We have tried elections. We have tried behind the scenes pressure and deals. None of it has had the slightest effect, nor did any of it prevent the expulsion of a single Jew from his home or increase the safety of those Jews still allowed to live in theirs. So why should any of that work now? The time has come to use a serious weapon. One that will force the situation. The time has come to use money. My modest proposal is that we withdraw as much cash as possible from Israeli banks. Also, if you have Israeli bonds, cash them in. It would also be helpful to stop using credit cards and pay for everything in cash. I was recently told that if as little as 1% of bank assets were withdrawn, this would send the system into chaos. I further suggest that, at the time of withdrawal, the bank manager be given a letter explaining that you are removing your money in protest of the Oslo Treason, and will not return your cash until such time as it is officially ended, the Palestinian Authority is null and void, and Judea, Samaria and Gaza are officially annexed to the State of Israel. As I said, a modest proposal. *It does not require any fancy organizations. I have attempted to anticipate and answer some questions about this idea. I am sure there are many others, but I do not promise that I will have the answers or answers that will satisfy. Question: I have outstanding checks and bills to pay. How can I possibly do this? It is your money that should be withdrawn, not your common sense. Of course you must pay your bills, and keep your business and other activities functional. No one is asking you to commit financial suicide. However, every agurah above that - take it out of the system and put it in a shoe box under your bed. Question: But won't this seriously hurt the economy? Is it really the right thing to do? Isn't this anti-democratic? Yes it will. When the Histadrut calls a general strike, the economy is hurt. When the dock workers staged a strike a number of years ago, it wrecked the economy for nearly a year. For over fifty years, the government subsidized the kibbutz movement with billions of dollars in free hand-outs and communist protection laws, and the economy was crippled. In short, there have been no lack of self-serving, greedy people willing to use all sorts of "anti-democratic" means, and to cause all sorts of serious damage to our economy, so long as they personally benefited. So, what is wrong in doing this with the intention of saving the country? Will placing all of Israel's industrial, transportation, energy and population within easy range of Arab mortars and cheap, home-made missiles be good for the economy? Will the Arab murderers ask the Jews to vote and approve before they open up on us with their guns and artillery? Question: I will lose a lot of money if I do this. Most of this money is either for my retirement or for my children's future. Is it really fair to jeopardize the future to make a political point? I suppose that if you really believe we and our children will have much of a future here after the government expels nearly 300,000 Jews from their homes and gives the property over to Arab murderers, then, by all means, hang on to your interest payments and coupons. However, if you suspect living in a beat up caravan and not having any means to support your family (as happened to the victims of the Sharon pogrom), or that having a Kassam crashing through your roof (as is happening in Sderot and the Negev today), might ruin the tranquility of your retirement or annoy your children, then consider my proposal. This is not about making a political point, it is using a powerful weapon to archive victory. Question: Isn't it pointless to try? As soon as this would start to be effective, the government would outlaw it. No it is not pointless. In fact, this has a very sharp and deadly point. One that will accomplish what all the demonstrations and elections have not: force the end of Oslo and the annexation of Judea, Samaria and Gaza. Furthermore, they can not outlaw people removing their own money from a bank without causing a serious crisis and jeopardizing Israel's international financial status. Question: If I do this, I will have a very large amount of cash around. Won't that make me the target of thieves? It will turn me into a nervous wreck, I just can't take the risk. It is perfectly legal, and not too difficult, to transfer your money to a foreign bank. Any lawyer or CPA involved with corporate law should be able to advise you how to do this and where it is the safest. You don't really have to put it all in a shoe box. A few bloggers have shown an interest in why I will not be attending the First International Jewish Bloggers' Conference. Before anyone criticizes me for having the hutzpah to pre-judge a conference before it even happens, please take the time to read what I have to say. I will first state a fact (bold) about the conference. After each of the facts (bold), I will state my observations and assessments (not in bold), with which you are more than welcome to disagree. You will undoubtedly be wrong, of course, but you are still welcome to disagree. After all, the State of Israel has delusions of being a fair democracy. Jews and un-Jews in Israel have delusions that democracy has anything remotely to do with Torah. Why shouldn't you have delusions of being right, when you're actually wrong? 1. The agenda has changed radically over time. The "panels" used to be smaller, and without moderators. Now they are bigger, and have moderators. But perhaps we can just chalk this up to being an "agenda in development." Personally, I think it's because "everyone wanted to get into the act." (Jimmy Durante),...and were going to throw major tantrums on their blogs if they weren't included. Tempted as I am, I do intend on naming names. Although I would love to get a hold of a video of the the conference so that I can confirm the suspicions I have regarding whose air is the hottest. 2. The panels include bloggers from varied backgrounds. I found it interesting that some of my fellow bloggers felt that it was not pluralistic enough. They may technically be correct. Let's face it. There IS an agenda here (highlighted by me below), even it is one with which I agree. I received this from Stephen Leavitt of Webads.co.il, who was kind enough to respond to my inquiry about the conference. I sent you the invitation because you are a Jewish blogger. No one is looking at your politics (unless perhaps you were anti-Aliyah). If you can't attend physically, you can still participate virtually via the webcam and chatroom. If that is possible, make sure you sign up for the virtual convention. In any event, I am not a pluralist, and am not in the least bit interested in participating in anything which provides equal time, and thus validation of, any anti-Torah perspective (respectful, secular Jews not withstanding),...regardless of any "good intentions." If an "aliyah" survival tips conference were held, I would certainly consider participating with bloggers as diverse as The Hashmonean, Israel By Day, Lines Writing Lines (Faith In Nathan), and The Big Felafel. I AM for "dialog" with Jews with whom I disagree, just not in this kind of forum. One of the panel participants My Shrapnel and I disagree on more than a few issues, but that doesn't stop me from appreciating the helpfulness I have found in her blog. Why do we have to have this kind of forced unity? Let those bloggers who agree with one another get together with each other. Let us, and let them plot and plan. Why not? Our mutual distaste for each other will probably serve as very effective motivation for networking and innovation. I most certainly will not be participating in any future conference which gives even a drop of validation to Arabs living in Israel. 3. The Conference has sponsors. WebAds.co.il and Nefesh b'Nefesh, whom I have nothing in particular against, are sponsoring the conference. I believe that one of the factors legitimizing bloggers as independent resources for news, information, and commentary, is our autonomy. If we were to have any kind of conference, I believe it should be of the bloggers, for the bloggers, and by the bloggers. Outside interests should stay...outside. Actually, we already have a Jewish Bloggers' Conference of the bloggers, for the bloggers, and by the bloggers. Founded by Soccer Dad, and currently run by Jack at Random Thoughts, it's weekly, and it's called the Haveil Havalim Blog Carnival. 4. The costs of at least few blogger's flights are being covered, in exchange for small favors, like writing about a new immigrant family's experience. Sounds nice on the surface, but then NBN gets to use your name. They may be a helpful organization, and you may like what they do (so far as I can tell, so do I), but this threatens to compromise your autonomy (See above #3). I was just informed that one blogger's flight is being covered for a reason not included in the above. I suppose that I am a partial recipient of this "gift," too, as I look forward to meeting this blogger in person when he arrives in Israel, and thus will receive benefit from the very money of which I am critical. Well, I guess I am now yotzei midei hovathi, regarding "full-disclosure." Even a drop of compromised autonomy may cause a "drop" in your legitimacy as a source of news, information, and commentary, which stands apart from the mainstream news media,...assuming you WANT to stand outside the mainstream news media. No doubt, there are more than a few of you who like a job with them, in other words with the "establishment." 5. At least one representative from the Israeli Foreign Ministry will be present. I hope he has enough room on his tuchus fur alle de kushen. 6. A representative from the Israeli Foreign Ministry will be given an opportunity to address the attendees. The director of "brand management" will be there. Bloggers I know of all sorts are critical of the government. What the hell is going to be doing there? I hope the my leftist and anarchist colleagues (if you could call them that) have just as much issue with him being there as I do (even though we couldn't give a rat's behind for the protection of each other's free speech,...let's be honest). The fact that bloggers are in the same room with him, and NOT heckling him, or at least there to ask him difficult questions greatly disturbs me. And, no, I do not care if he is "just a civil servant" or not. He's part and parcel of the guh-ment., or if you like, the G. O. Y. (Goverment Of Yisrael). Even worse, he may be there to provide tips on public relations [PR], which I am ardently against. For goodness sakes already! Who gives a hoot as to what the goyim think of us?! They either want to kill our physical selves (Yishmael) or kill our spiritual selves (Esau) . Move on! And, as for communicating with Jews outside of Israel, we certainly do not need any marionette strings surgically attached by some guh-ment official. Why would I want to team build? Well, actually, I might, but not with my arch-nemeses. And, why on earth would I want to participate in "Team-Building" designed by the very Israeli Defense Forces [IDF] which expels Jews from their homes, destroys batei keneseth (synagogues), and whose "rabbis" have been silent about it? Why would I want to participate in "Team-Building" designed by the very IDF which throws soldiers in jail for choosing HaShem and Torah over anti-HaShem and anti-Torah "orders?" No thanks. I don't care how effective, or ineffective their indoctrination "team building" techniques are. I want no part of them. Clarification: My issue is not with the soldiers not IDF per se. It with the generals, and in particular any pseudo-religious generals, running the show. As I commented on Life In Israel's post on the conference, the minute someone makes a big deal an event's food being "mehadrin," when half the people at said event may not even know what that means, yet feel they to pretend that they do, my experience is that I should be suspicious about how "mehadrin" the event itself will be....and no, I am not talking about separate seating. I do find it odd that the "frum contingent" is apparently "frum" based on its livush, not the least of which is its collection of black hats. Oh brother. It looks like Jerusalem maybe be invaded by even more "American Haredim" (sigh) For those of you unfamiliar with this term, one neither has to be American nor "haredi" to qualify. In fact, some claim that being truly haredi automatically disqualifies you from being "American Haredi." I mean let's face it. Anyone who identifies as "frum" couldn't be THAT "frum," and anyone who identifies as "ultra-orthodox" couldn't be THAT ultra if s/he is attending a mixed, essentially social, event. See, leftists? The conference isn't as slanted as you thought! Sure, lots of bloggers have expressed concerns about anonymity. The conference planners believe that they have taken care of this with the video feed option. Even though those watching could be easily traced. Let's face it. The Shabba"k (Israeli secret police) already knows who each and everyone of us is. They have already "visited" Nati of Mystical Paths. They READ English language blogs. I also have no doubt that there are bloggers out there who are actually sympathetic to the Shabba"k "Jewish Department." That's not the point. As a very wise rabbi once said, "If a Shabba"k agent is too lazy to pick up the phone book to see that your address and phone number are listed, then by all means, do NOT help him do his job." "*Spaces are limited and admission is subject to approval." As spaces are very limited, and there has been huge interest, we are trying to ensure that everyone who is admitted is a bona fide blogger. You will be notified shortly regarding admission to the conference. Small comfort, as I am more concerned about the nut jobs who ARE bona fide bloggers, than anyone trying to sneak in. Yeah, who would try to sneak in? I guess we'll have to see how good the security turns out to be. "Any jblogger can sign up to participate. Kvetching before it happens and not taking part is like complaining about the results of elections you don’t vote in. Vote with your feet or mouse…"
In theory, this makes sense, yet, I believe I have produced enough evidence (my opinions aside) to show that "establishment" is involved. To what degree it is involved you may choose to debate. To what degree one is comfortable with the involvement of the "establishment," is for each individual to decide. I, for one, stopped feeling comfortable with the "establishment," long before the "establishment" failed to prevent an Arab from blowing himself right next to me, six years ago, and failed to compensate me with a single "establishment" sheqqel. Now you know why I blog. It's because of the "establishment" I blog. 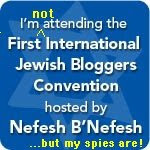 And, now you know why I am not attending the First International Jewish Bloggers' Conference. Haveil Havalim #178 is up at The Rebbetzin's Husband. It's the Tu b'Av Edition. (IsraelNN.com) Angry activists are planning to block entrances to the houses of senior officials in the Yesha Council, as well as hire private investigators to follow them around, according to a report Sunday by IDF Army Radio. Leaflets calling on the public to "Stop Yesha Council's hegemony in order to prevent the Gush Katif scenario from re-occurring," will also be distributed, said activists. The measures are being taken to protest the decision by the Yesha Council leadership to accept a government proposal to abandon the Migron community site and move its 40-plus families to an area closer to Jerusalem. As usual, the government will get what it wants. Remember? Not even a "democratic vote," of 60 percent of Likud members against the expulsion of Jews from Azza becoming Likud Party policy, could stop then Prime Minister Ariel Sharon from doing whatever he wanted. 3. or some mamlachti nonsense about "unity taking precedence over all else"
Like I said, Migorn's going, and protests accomplish little to nothing in the end, save for gaining some publicity. People are going to make protests anyway, because they feel, as any normal Jew would, that they have to try to do something. "The road to Hell was paved with 'good intentions.'" I highly recommend that you book mark or subscribe to feeds from The Key To Redemption blog. She keeps tabs on Xian activity in Israel, and knows which "code words" to look for. She goes deep into Xian sites to dig up the information which unfortunately not too many "right-wing" Jews want to see. Then when "left wing" Jews bring this stuff up, they are ignored or laughed at because of their "intentions." Below is just a sample of the information she has gathered regarding Xians' intentions to come to Israel, to stay, and to missionize. She also exposed the false "Efraimites" who visited Kfar Tapu'ah recently and two years ago, and their real intentions. Joel Bell and his wife are xtians living in the tribal land of Binyamin. They run Frontline Israel. "They serve the Jewish people in the land of Israel teaching the covenants that G-d has with Abraham, Isaac and Jacob, and their descendents, and with those who have been grafted in to the commonwealth of Israel. Says Joel Bell, Director of Frontline, "G-d is so real to these people and to us simply because we hear the Word of G-d and we obey it - together, becoming pleasing to our Heavenly Father and receiving our eternal inheritance." The following are excerpts from an email sent by Eddie Chumney of Hebraic Heritage Ministries. This e-mail concerns the plans to start a GLOBAL organization to be called,"Worldwide Biblical Zionists" at the invitation from World Likud in the land of Israel to work with Judah in the land to "build up Zion". In January 2007, the Chairman of World Likud, Danny Danon appointed Joel Bell to begin the initiative to unite Bible believers all over the world to work with World Likud to "build up Zion". Within a year, we want to have 1 MILLION members of this organization. Joel Bell will be the director of Worldwide Biblical Zionists. Eddie Chumney of Hebraic Heritage Ministries Int'l will be working closely with Joel to build the network to accomplish this vision. The want more than our souls. They want to implant themselves here, and to take our Land. See how the so called Christian Zionists have been exploiting this video with Arutz 7's Yishai Fleischer. Yishai says many things with which I agree. He tries expose the "lies" perpetrated by the media about what is really taking place here in Israel, and specifically in Yehudah and Shomron. But what about the lie which is Christianity? What about their conveniently changing philosophy over past 30 or so years to get a foot hold into the land? There is NO difference between overtly missionizing, Xians and so-called Xian Zionists. But for those "right-wing" Jewish brothers of mine who seem to think that there is a difference, can't you even "Google" the name Marty Gale, to find out his real intentions? Bookmark or subscribe to The Key To Redemption blog. The road to hell is paved with good intentions. Why on earth do you have to invite Hell's gate keepers into your home? *This blogger has absolutely no idea who will or will not be showing up at these protests. **Also bookmark or subscribe to Tomer Devorah for more information about the Xian threat. So, I come home tonight, hungry, and there isn't any food in the house. No nothing. No potatoes for the deep fryer. Rice takes too long. No vegetables, unless you count canned baby corn and tinned mushrooms I was saving for some Shabbath. Well, I guess you can tell how healthy I have been eating lately. Just some eggs, a can of tuna, and for some reason, a couple of slices of cheese. Not a terribly exciting kitchen, but it forces us to be creative. I haven't posted any meat recipes calling for an oven, because I can't provide accurate temperature settings, as the oven's numbers on the dial are off. Over time, I have learned what they mean, but that would be meaningless to you with your ovens. As I mentioned above, I found eggs, tuna, and cheese. Dry It doesn't take a rocket scientist to figure out that an omelet is the most likely conclusion. And, no, I obviously do not hold by the [copying] mistake in the Shulhan Arukh regarding fish and dairy together. Yes, everyone, it's a mistake. I await the onslaught of your e-hate mail and comments. Fry the tuna in a little bit of canola oil, or olive oil, on one side of the pan. I like to fry the hell out of it, until it starts to brown. No, I am not really concerned with breaking down all of the amino acids, nor stinking up the house. I am concerned with taste here. Oh, I forgot. Where's the dairy pan? Oh, yeah, it's over there on the dairy counter. Chop up some garlic, and fry that too, on another side of the pan. When it's almost to your liking, mix it up with the tuna. Push everything to one side of the pan. Add two well-beaten eggs to the other side of the pan. After is cooks for a couple of minutes, scoop the tuna mixture onto the eggs on the other side of the pan. Where's the dairy spatula?? Oh, it's over there, the white one. The meat one is black, and a different shape. Even I can't confuse the two. I suppose that I should wash it first, huh? I notice the dairy knives in the sink look the same as the meat knives. Can't they get confused?? "No," my roommate says. "If the daily knives never leave the dairy counter [of our luxuriously small] kitchen, they can NEVER get confused with the meat knives." "Ya'aqov, don't treif up the kitchen or else!" Add spices, like a little freshly chopped parsley, and top with your favorite cheese, or whatever cheese you happen to have in the fridge. Add another well-beaten egg to the other side of the pan, so that it fills up any remaining pan surface. After it cooks for a couple minutes, flip the side with the tuna over, onto to the other side with the newly added egg. I wish I could provide you with a picture, but alas, I do not have a camera. I'll just have to add it to my wish list I sent to Jacob Da Jew. The YeSh"A Council has been denying that they have been in negotiations to dismantle towns in Yehudah and Shomron for months now. 1. Migron isn't being dismantled; it's being moved. So we weren't lying when we said we weren't in negotiations to dismantle settlements. 2. We changed our minds. It's for our own good, in order to strengthen other settlement blocks. 3. The government will NEVER evacuate Ofra, Bet-El, Kokhav Ya'aqov, nor Pesagot, so Migron will most likely be within any future border arrangement, and we can choose to build there in the future. Now what I'd like to know is, just exactly WHO is on the Yesha Council besides Danny Dayan. Whoops! The Yesha Council Website is down, so I am unable to access that information. How convenient! I always thought that the regional council heads are automatic members of the Yesha Council. So if Avi Ro'eh (Binyamin) and Gershon Masiqah (Shomron) are against such an agreement to move Migron, then how could the Yesha Council decision have been unanimous, unless the make0up has changed, and the regional heads no longer sit on the council? Meanwhile, the verdict is still out on what the residents will do. Sure the above report says that they're not going without a fight. But, we still don't know what that means, and we still haven't heard from Rav Tzvi Tau, the rav and spiritual leader of many of Migron's residents. Previously I stated that all eyes should be on Migron. But, now I'm not so sure that this will be the critical juncture I thought it would be. Gershon Mesiqah says that blood will be spilled. My bet is on some kind of symbolic resistance, and then they're up and out of there. The only major resistance will come from the new stronghold, adjacent to Migron, established by Youth for the Sake of Eretz Yisrael, or those sympathetic to their cause. I think it might go pretty smoothly, with only those in the adjacent stronghold getting pummeled (May God forbid), demonized, jailed, and demonized some more, with the Migron residents quietly packing up, and disassociating themselves from "those fanatics." One of the residents of stronghold reported that they are "not welcome" by the mamlachti residents of Migron. No surprises there. How dare Jews settle the Land without official, government approval! (sarcasm) ...which residents of Migron continue to insist that they have such permission. All I can say is to bring cameras, and we'll see what the government has in store for photographers during this round. When are they going to wake up,...and stand up? When there's a conflict between halachah and the government, go with the halachah. So what will happen to Migron? Who knows. But more miraculous things have happened in the past. Maybe they will wake up. Reader: Why for is that, Ya'aqov? The "Tisha b'Av" Edition of Haveil Havalim is up at Simply Jews. In case anyone hasn't noticed, traffic has been getting worse in Jerusalem. Work on the Light Rail section on Yaffo Street has caused a lot of people, including yours truly, a lot of inconvenience. 1. If you're crossing Yaffo Street on the bus from the north (no. 4, 22, 30), and just need to get to the center of town, get out and walk. You'll get there faster than the bus. 2. Give yourself an extra 20 to 30 minutes to get to your final destination. No, I'm not joking. All of the buses running along the section of Yaffo Street between the shuq and Kikar Safra (City Hall) still get to where they're going,...eventually. In the event map above, to enlarge. If you can't [yet] read Hebrew, know that the yellow-colored strip is Yaffo Street. The white strip cutting through Yaffo Street is Strauss to the north, and King George to the south. The street running parallel to Yaffo Street above is HaNevi'im (ie. not Malkhei Yisra'el). Egged's English Site, including a time table search I prefer over the one on the Hebrew site. This afternoon at around 12 noon, a white, Subaru hatchback, lic. #674 - 1567, was spotted driving around K'far Tapu'ah. The driver appeared to be in his 50's, with long graying hair pulled back in a ponytail, with a significant bald patch on the crown of his head. He was wearing glasses as well. The car was seen moving up one street, making a U-turn, and backtracking. He would then repeat the pattern. A camera was mounted on its dashboard. The ravsha"tz (town security chief) was approached, and he explained that the driver claims to be mapping the yishuv (town) for a GPS (global positioning system) service. 1. Now, assuming that the driver was, indeed, mapping the yishuv for a GPS, then why? It's a small town. Why do people need to know the details of a small town? If you visit a small town, whether in Israel, the U. S., France, or Brazil, and you're looking for someone's house, you ask for directions. 2. Why is it necessary for a town at risk for Arab infiltration, and in fact has been infiltrated, to allow a map to be made public for all Arabs and leftists and anarchists to see and to study? We went through this already with a British newspaper publishing a map of Tapu'ah, and recommending weak spots for possible entry in secret. In addition, the Israeli government has put restrictions on services such as Google Earth, for security reasons. 3. And, lastly, the verdict is still out. We still don't have confirmation as to what he was really doing here, if was mapping out the yishuv for a GPS service, or a Shalom Akhshav (Peace Now) self-hating, Eruv Rav, nut job. 4. If you see such a vehicle roaming around your town, report it. At the very least, residents have a right to decide to have their town added to such a data base. 5. Do we get to see into Arab towns, too? Doubt it. Does the Pesha* Council (Yehudah, Shomron, and Azza) still deny it has been collaborating with the government to expel Jews from their homes? (IsraelNN.com) The Binyamin Regional Council management rejected the proposition by Ze'ev Chever ("Zambish") to cooperate with the government in the eviction of the residents of the Migron community, which the government says is an illegal outpost. Chever's position was rejected by a vote of six to one. Now that's what the Binyamin Regional Council has to say. We haven't heard the last of this. That's obvious. I previously predicted that there might actually end up being an agreement of some sorts between the residents themselves and the government, to relocate. Thus any "rulings" of the Binyamin Council would be rendered irrelevant. Most residents of Migron are mamlachtim, albeit of the frumer than average, Rav Tzvi Tau variety. Mamlachtim generally have nutty ideas about the relationship between Am Yisrael and the [almighty, lehavdil] State of Israel, like that we have to listen its government even when it makes pronouncements against hallachah. ג,י [ט] המבטל גזירת המלך בשביל שנתעסק במצוות, אפילו במצוה קלה--הרי זה פטור: דברי הרב ודברי העבד, דברי הרב קודמין. ואין צריך לומר אם גזר המלך לבטל מצוה, שאין שומעין לו. 3:10  One who nullifies a decree of the king for the sake of being involved with misswoth, even a lesser misswah -- is exempt [from punishment]. The words of a rabbi, the words of a servant, the words of the rabbi take precedence. And one does not need to say that if the decree of the king nullifies a misswah, that one does not listen to him. ...all the more so, one does not listen to someone, who is not a king, which decrees the nullification of misswoth. The above quote from the Ramba"m was invoked more than once by Rabbi Meir Kahane HY"D. No body seemed to get it; no body offered any legitimate, hallachic argument, just the usual "No, you don't understand. It's more complicated than that." No, it's not in the least bit complicated. But since when have the mamlachtim employed hallachic reasoning in these matters? *Pesha is Hebrew for "crime," and rhymes with "YeSh"A." I recently reported on one of the increasing number of police strategies designed to make life for residents of Yehudah and Shomron (Judea and Samaria) difficult. Maybe this strategy will finally wake Jews up to the fact that, at this very moment, the Israeli government is testing all sorts of ways to ease our removal (Read: Expulsion) from these ancient Jewish areas. Taking away our weapons, raids on yishuvim (towns), closing off the holes in our fences, securing us for ease of removal, including but not limited to tear gas and violence,...when the time comes. JERUSALEM -- Israeli police, in what appears to be a new tactic to quell Jewish nationalists, have begun to use Arab provocateurs in the West Bank. Police have acknowledged that they used Arab stone throwers to stop young Jews from hiking through the West Bank on July 29. Police detective Aharon Yair told a Jerusalem magistrate that Israeli security forces colluded with Arab provocateurs as part of an ambush to arrest the hikers. You may call me a conspiracy theorist, but remember this. Conspiracies are supposed to be secret. If this is just a conspiracy, then the Israeli government isn't doing a very good job at hiding it. Yossi Beilin YSh"W (Shimon Peres's true heir-apparent) has been quite clear about his desires, and his belief that a Jewish state is no longer necessary. We have a misswah lo ta'aseh "Lo Tehonem..."
The Israeli government has got it backwards, and they are doing so, with full cognizance of the implications. They are working against Torah; they are working against HaShem. And where are the rabbis? Why aren't they talking about this misswah? Is it not also part of the Torah? Fortunately, some rabbanim are talking about the importance of employing only Jews. That's at least a step in the right direction. For more on this misswah of "Lo Tehonem," which many you may have thought was just made up by "fanatics," or "no longer relevant in current times," or didn't know existed at all until now, please click here for free, audio downloads on this topic in English. Haveil Havalim #176 Is Up! Haveil Havalim is up at Little Frum House on the Prairie. It's the Dirty Laundry Edition. Check out the great collection of posts, and the great set up with pictures! Early last week, while tremping into work, I bumped into two more soldiers. One was only just released from the army a couple of hours beforehand and was on his way home to shower and sleep for a very long time. Next on his agenda is to travel. I encouraged him to travel throughout Israel, instead of leaving for destinations unknown, like the popular avodah zarah-filled India. He agreed, and has planned to hike the Shvil Yisrael from Metulah in the north to Eilat in the south. He seemed intrigued by leaving for adventures outside of Israel after that, but hopefully not. I suggested that no one can escape from places of avodah zarah completely unscathed. He eventually wants to go to college to study biology. Just before he and I got into a tremp, another soldier appeared on the scene, a former student of mine, taking eighth-grade English with me seven years ago. I had just mentioned him, too, in the context of who I knew in his yishuv (town), Kokhav Ya'aqov. He didn't have the greatest time in my class, but apparently I made up for it in the end. I came with his class on its end of the year trip to the Gallil and Golan. I was one of the few people who thought to bring a camera, before the prevalence of digital everything. I took photos of everyone and sent copies to those who were in each of them. He smiled, and said he still had that photo from seven years ago. I haven't traveled much in Israel, but that trip was one of the best I've taken. Let's hope this soldier makes it through the next few months, the last of his service. That night, I bumped into another former student. This one has been in yeshivah for the last four years, and expects to begin his IDF service shortly. In order to do so, he will have to leave his current yeshivah, and transfer to a yeshivath hesder. He will be leaving, albeit temporarily, his mamlachti yeshivah, and probably be going to Merkaz HaRav Kook. I told him that I approved of the change. Unfortunately, I did not have a chance to list the books he will be able to read at "Merkaz," "unwelcome" at his current yeshivah, like Rav Moshe Tzuriel's shlit"a Mafte'ah to the Torah of Rav Kook ztz"l, and the compilation of Rav Kook's writings found in the Merkaz HaRav Kook genizah. It is crucial to protect our soldiers spiritually, as well as physically, something which the IDF does not do, rather the opposite. My soldier friend who came to visit last Shabbath told me about the educational trip he was forced to take to the Kotel, the Western Wall. His unit was lectured on Islam and Christianity, not the two items highest on a Jew's list of topics he associates with an "educational" trip to the Kotel. The two topics were taught as fact, not within the context of the history of Israel's occupation by foreign forces. One of the soldiers questioned the lecturer's take on Islam as one of the "truths" in the world. He was "written up" for that. So, where is this blog post going? I'm not sure. I suppose this is what some bloggers, and others, call a rant. Although, I always thought that "rant" had a negative connotation. I am just exploring my own relationships with soldiers, the sons, and brothers, and fathers, and friends. Yet, I will also have to explore my relationships with the Jews who have to make decisions, decisions to follow orders contrary to Torah, or to refuse them. Many soldiers avoided participation in the expulsion of Azza Jews three years ago. Golani and Nahal Haredi Brigades were kept far away from Azza, for fear of mass refusals to carry out orders. Yet, the IDF only wants you to know about the 62 soldiers who actually sat in jail for refusing orders. If you're a soldier, and you're reading this, ask yourself this question: Which soldier will you be? "I'm just 18 years old, and I'm confused by conflicting rabbinical opinions." You had better do your research, and talk to your rabbis now, asking for hallachic sources, and rejecting "feeling" and hashqafic ones. You are going to have to face this decision sooner than you think. In the meantime, you'll have Jews like me on your back, pressuring you to think for yourselves and hallachicly so, and hopefully encouraging you as well. Jameel @ The Muqata wrote a piece on Aliyah which I thought was worth reading. While attitude is important, and has certainly gotten me through more than a few scrapes, I believe that with a sense of community one can do anything. I used to be very much against English-speaking ghettos, and the idea of myself actually living in one highly disturbs me, the trendier, the more disturbing. However, if olim (immigrants) find a sense of community there, and support, then more power to them. Now that I think of it, I'm not sure how this affects ones development of the attitude Jameel is talking about. Nonetheless, a sense of community is crucial. One obviously does not have to live in one of these ghettos to achieve a sense of community. (Sorry, but, no I do not intend to refrain from referring to them as ghettos anytime soon.) After all, I didn't. It may have been more difficult for me (I don't know), but I have survived outside of the ghetto for 11 years now (Aliyah date: 26 of the Fourth Month 5757/July 31, 1997). While we're on the subject of aliyah, I wanted to offer a few additional helpful bits of information for your readers. A rav from your neighborhood (For anyone who doesn't know, the Muqata is located in Ramallah), whom I respect and has much experience in these matters, said that studies show that an oleh's most difficult time is during the first year and fifth years. This information was received from the Amana Company. I'm sure it's not written in stone, though, and there are many variables. Which years were most difficult for your readers? The point is that if you have a difficult time during one of these years, you are not alone, and the knowledge that you are going through an expected rough patch may help to lower your anxiety. On the other hand, you may want to pick up your monitor and throw it at me. I suggest that instead of throwing your monitor at me, possibly costing you 100's of sheqqels, that you pick up the phone and call someone, and talk about whatever you're going through. Hopefully, you have been developing such a list of people, as part of your "surviving aliyah" pro-active strategy (See above regarding community). Twelve years ago, when I first visited a shaliah (emissary) in the U. S., I was told that 50 percent of all olim from North America return "home" [to North America] within five years. So, if you have made it in Israel five years, then pat yourself on the back. You have accomplished what only half of North American olim have been able to do! I would imagine that this statistic has changed after 12 years, and hopefully improved, but still, five years is still worth a pat on the back, or a special family meal, a barbecue, or sponsoring a qiddush in your beth kenesseth (synagogue). Why wait five years? How about every year? I was turned onto this idea by a family in Beth El, by the way, who marks the occasion annually. I have no doubt you have already heard of this idea, and quite possibly apply it yourselves. So, while attitude is important, don't forget the importance of building a sense of community. Find a shi'ur you enjoy, join a club related to your favorite sport or hobby, whether it be mountain biking, surfing, knitting, or chess. Join a club with native Hebrew speakers in it, too, and you'll be on your way to learning new vocabulary, you have the motivation to learn. I wish it were as easy as it sounds. It's not. At least, it wasn't for me [and still isn't]. Persevere, and remember, Israel is the Homeland of the Jewish People. You belong here! I mistakenly left Jameel off of my favorite blogs list. I felt bad afterwards, especially when I heard that Jameel was hurt that I stopped stocking him. Last Thursday, I started stocking him again, but felt that wasn't good enough. Jameel, I hope this post [and the measly four or five hits it will generate you] makes up for my meta-blogging faux pas, and blogger networking suicide. News Flash! Attempted Theft Of Flock in K'far Tapu'ah! Shabbath afternoon around 12:45 PM, members of the Kitath Konnenuth (First Response Team) were called to the entrance of K'far Tapu'ah, where a possible infiltration was in progress. An Arab approached the goat pen situated near the main entrance of the yishuv (town), and attempted to steal the flock. The thief evaded capture by hiding himself. The flock was recovered. It is unclear how this Yishma'eli thought that he could get away with such a thing in broad daylight, and so close to IDF soldiers on guard duty.